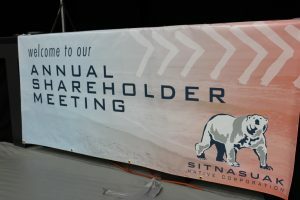 The 45th Annual Meeting is scheduled for Saturday, June 1, 2019, in Nome, Alaska. Alaska Airlines has issued a discount code of ECMC267 for travel to the annual meeting in Nome. Eligible travel dates are May 24, 2019-June 3, 2019. Enter the discount code at alaskair.com. 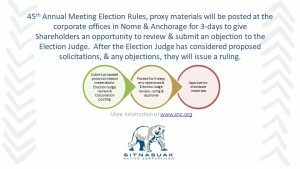 Information for Shareholders: the 45th Annual Meeting Election Rules provide that solicitation materials will be posted at the corporate offices for 3-days to give Shareholders an opportunity to review & submit an objection to the Election Judge. Materials are available Monday-Friday from 8:00 am-5:00 pm in both the Nome & Anchorage offices – see the Shareholder Department.